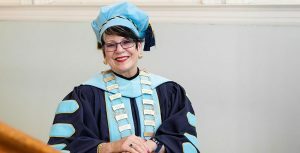 Clarion University of Pennsylvania held the inauguration of Dr. Dale-Elizabeth Pehrsson as 17th president on Friday in the auditorium of Marwick-Boyd Fine Arts Center. A large number of faculty, students and Clarion residents attended the ceremony. 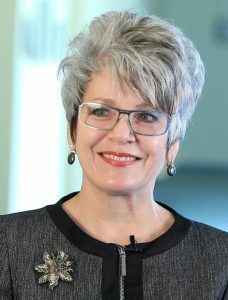 Prior to her selection as Clarion’s president, Pehrsson was dean of the College of Education and Human Services at Central Michigan University since 2012. She also spent a year as a presidential fellow with the American Council of Education, working directly with the president at Misericordia University in Dallas, Pa. The fellowship focused on faculty and staff development, Board of Trustees relations, fundraising and capital campaigns, finance, accreditation, inclusive excellence, advancing technology, strategic planning, community engagement and service learning. Pehrsson has a Bachelor of Science degree in liberal studies from the University of State of New York-Albany. She also earned a Master of Education degree in curriculum, instruction and supervision, a Master of Counseling degree, and a Doctor of Education degree in counselor education and counseling, all from Idaho State University. She also has associate degrees in nursing and liberal arts. Pehrsson began her duties as Clarion University president July 1.